Zhang; known as "the Terrible," was a ruthless Üthrari barbarian warlord who, beginning in AR -133, conquered the eastern peoples known as the Hakeen and brutally enslaved them. Zhang was responsible for the destruction of the Xholar Empire; a thriving, cultured, Hakeen civilization; leaving only a few ruins as its monument. Zhang's first major victory was the capture of the city of Zocolo in the year 310/4. 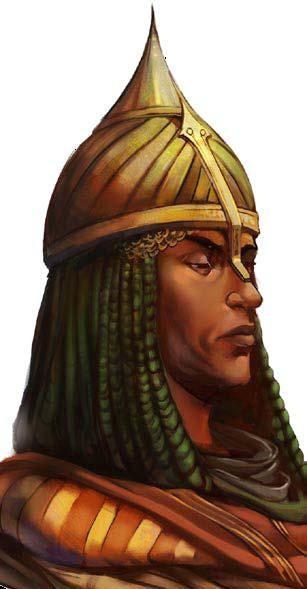 His armies then captured and burned the Hakeen capitol of Ashkavan in the year 325/4; effectively ending the Xholar Empire on Corwyn. Despite a long military campaign and brutal siege, Zhang was never able to capture the Hakeen city of Zhin; which survived to live on as the only remnant of Hakeen civilization in eastern Corwyn.